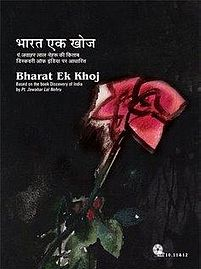 Bharat Ek Khoj was a Hindi TV Serial which was aired on DoorDarshan many years ago (originally aired in 1988) and it got critical acclaim as well as love and affection of public both. Shyam Benegal did a fantastic job as a director and all the lead actors played their part with equally great efforts. But the most remarkable stuff was the Research and development done in order to make the stuff more authentic. The TV Serial was based on the famous book by Late Pt. Jawaharlal Nehru – the first prime minister of independent India – Bharat – titled as “Discovery Of India” – Hindi translation – Bharat Ek Khoj. वोहीं सच मुच में जानता. नहीं है पता, नहीं है पता………..
ऐसी ही देवता कि उपासना करे हम अवि देकर.. The TV series is now available (since a few years) for home viewing in two variations. The content however is same in both the editions, the resolution is scaled down in 9 DVD set to fit the content. Recently in an interview with Purushottam Agrawal for Kitaab, Shyam Benegal shared some of his memories regarding Bharat Ek Khoj. Here is the video available under YouTube standard license. You will enjoy this video for sure.